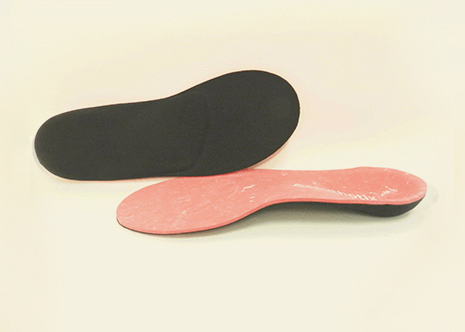 USAGE: This orthoses works extremely well for the patient who prefers to wear a comfort shoe like a walking shoe or a slip on type shoe. MATERIAL: A polypropylene shell with a moderately deep heel cup to provide maximum support of the medial and lateral arches of the foot and heel control. 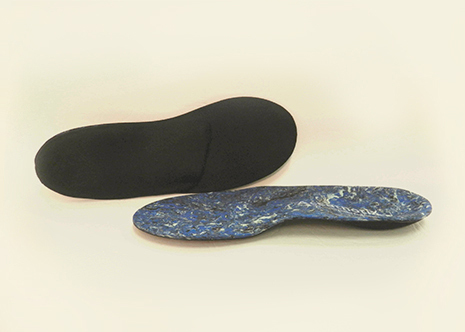 POSTING: Intrinsic posting to allow for the variety of shoe styles in the “comfort “category and to reduce the weight of this orthoses. TOP COVER: 3mm pink EVA top cover for shock absorption and durability. TOP COVER: 3mm black and blue swirl EVA top cover for shock absorption and durability.